Slice the sausage link in half crosswise, and then slice into 4 or 5 thin slices lengthwise. In a small skillet, brown the sausage on both sides, until brown and crispy, then set aside. Whisk 2 eggs in a small bowl with the milk, salt, pepper and seasoning. Slice the Ciabatta rolls in half horizontally. Heat the butter or margarine over medium heat. Add the eggs and cook until firm around the edges, about 3 minutes. With a spatula, form the egg into a rectangle, letting the liquid egg remaining flow around it. Continue cooking and shaping with the spatula until firm enough to flip. Flip and let the other side cook until the eggs are firm, but still moist, another 2 minutes. Remove eggs from heat. Put half of the eggs on each of the bottom Ciabatta rolls or 2 slices or rye bread. Top the egg with the thinly sliced sausage and then place a slice of cheese on top of each one. Top with the roll tops or 2 additional bread slices. 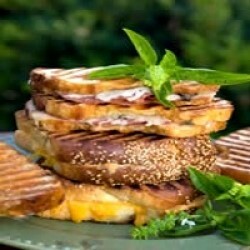 Grill or cook in a Panini press until sandwich is hot and cheese is melted.